For anyone monitoring their traffic from Google, it’s not really a revelation that a single page can rank for hundreds (or even thousands) of relevant keywords. 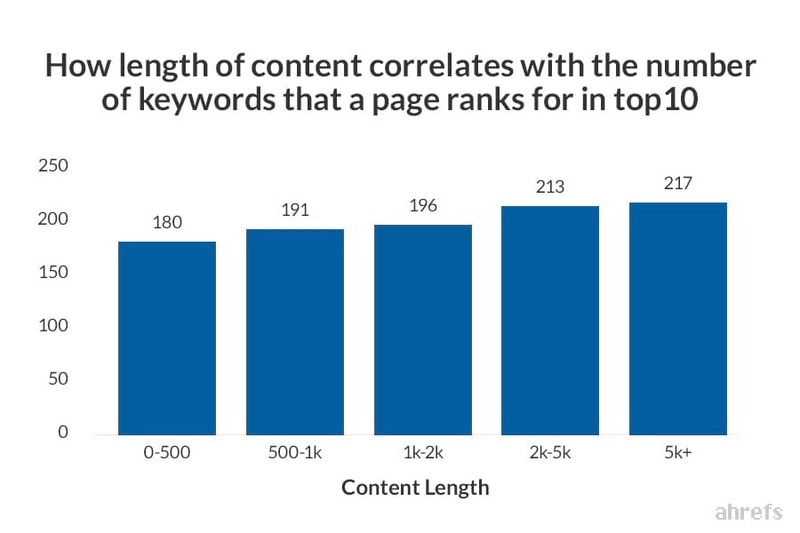 But how many keywords exactly will an average page rank for? That’s the question we wanted to answer (plus a few more), so we picked 3 million random search queries and looked at the top‐ranking pages and how many other keywords they rank for. How many keywords do the top20 ranking pages “also rank for”? By saying “also rank for,” I actually mean “also rank for in top10.” For if you’re not in the top10 search results for a given keyword, you’re hardly getting any traffic from it. It looks like the average #1 ranking page will also rank in the top10 for nearly 1,000 other relevant keywords (while the median value is more than two times smaller — around 400 keywords). 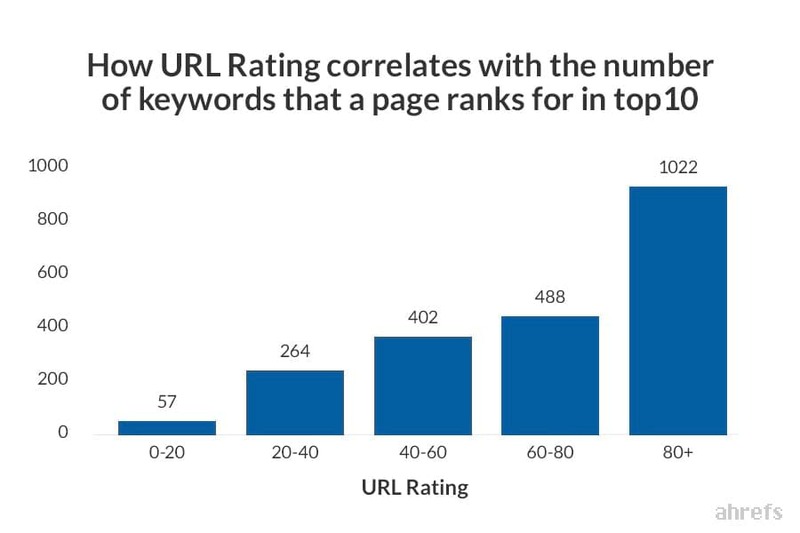 And the lower ranking pages tend to rank for less keywords. keywords with search volume over 10,000 searches per month. We wanted to know if ranking for a more popular keyword would result in ranking for a larger number of relevant keywords. Which appeared to be exactly the case. It’s always fun to look at outliers, right? Outliers are the actual reason why we study average and median numbers separately. Quite a few pages rank for an enormous amount of keywords, which drives the “average” numbers up. For the previous experiment, we removed the biggest outliers to make the data more representative, but even then, the gap between average and median values was quite substantial. So let’s see which pages rank in Google for an enormous amount of keywords. 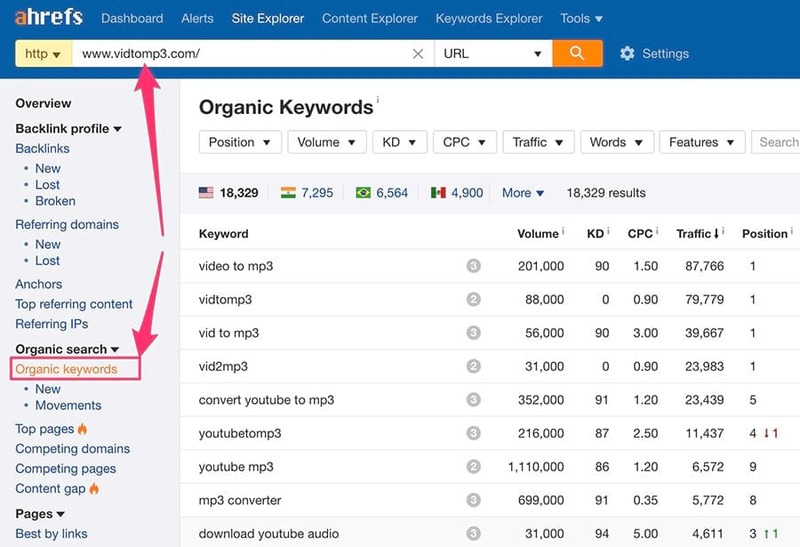 You can put any of these URLs into Ahrefs’ Site Explorer tool and navigate to the “Organic keywords” report to see all the keywords they rank for. Top100 URLs by “also rank for in top100” keywords: Global / US. Top100 URLs by “also rank for at #1” keywords: Global / US. Research these pages with Ahrefs’ Site Explorer and learn from their success. How many high‐volume keywords can you “also rank for”? There’s nothing surprising about ranking for thousands of long‐tail keywords with a single page. But what about the high‐volume keywords? How many of them can a single page rank for? 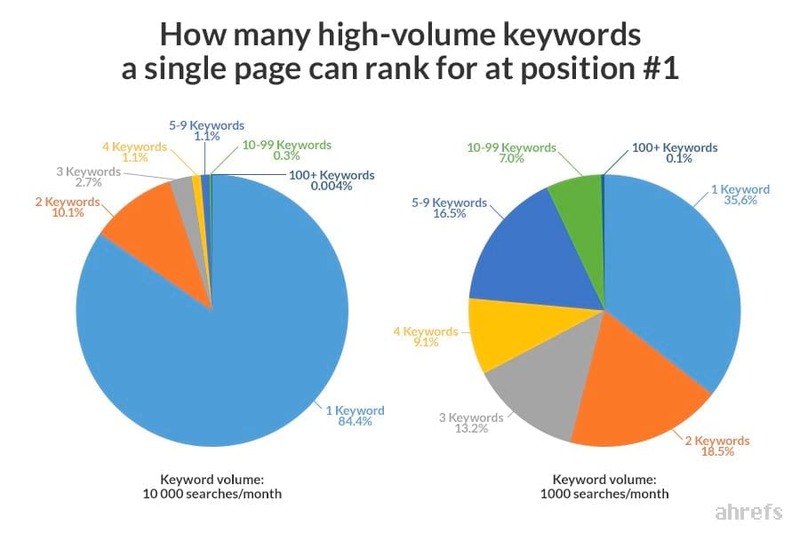 To study this, we took all the pages from our sample that ranked #1 for a 10k+ keyword and looked at how many other 10k+ keywords these pages also ranked for (at position #1). We then replicated a similar experiment for pages that ranked #1 for 1k+ keywords. 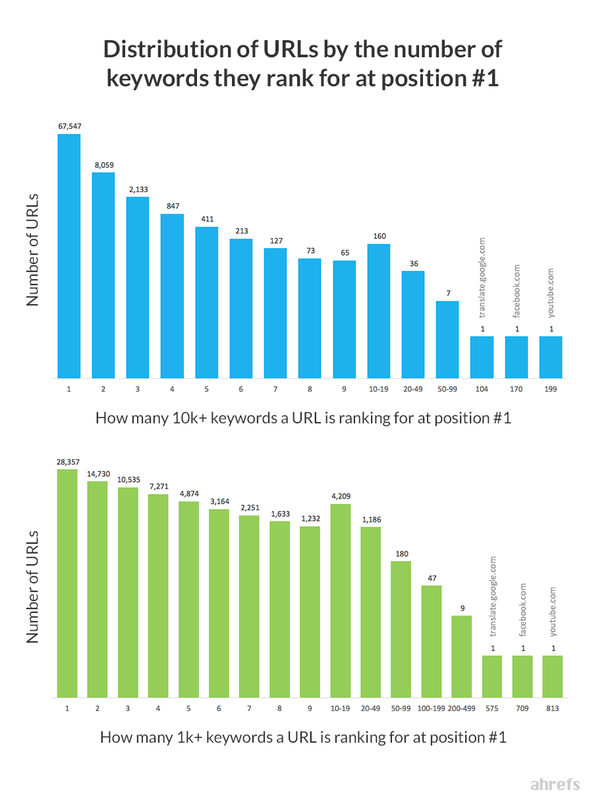 Unsurprisingly, the majority of URLs have ranked #1 for a single high‐volume keyword. But the raw numbers on the above graph might seem a little bit misleading, because it’s hard to put them on the same scale. So we have calculated what % of pages in our sample ranked at the top for one keyword, two keywords, three keywords, etc. It turns out that ranking for 2–3 keywords with over 1,000 searches per month is quite common. While ranking for more than one 10k+ keyword with a single page is very rare. 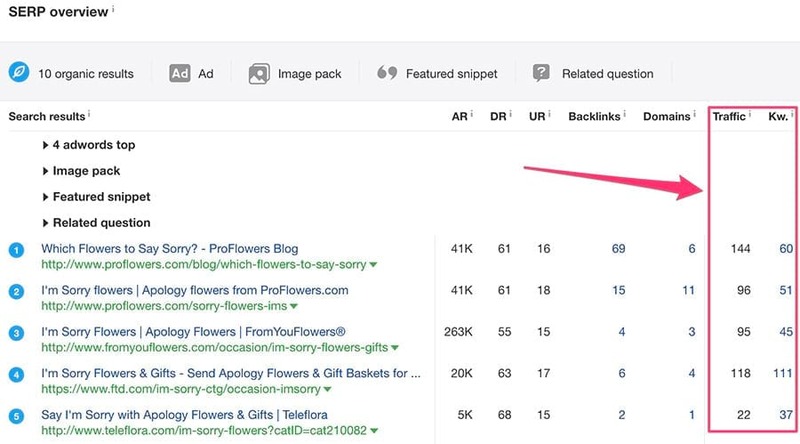 How can you rank for more keywords with your page? As you can probably tell by looking at the above‐mentioned outliers, the best way to rank for more keywords is to choose the right topic. Certain topics tend to have a huge search demand and a ton of relevant search queries, while others simply aren’t popular enough to provide you with a variety of keyword searches. We’ve covered this in our guide to long‐tail keywords, but I guess it won’t hurt to mention it again. When planning your content, don’t just look at the search volume of the primary keyword you’re targeting. 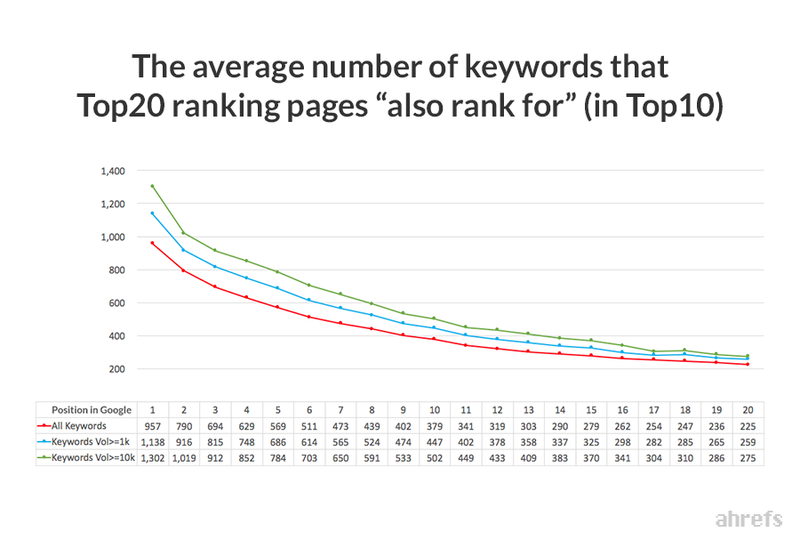 You should pull the top‐ranking pages for that keyword and see how many other keywords they also rank for and how much search traffic it brings them. I often use the keyword “I’m sorry flowers” to illustrate that. The monthly search volume of this keyword is only 250 searches per month, which may seem that it is not worth targeting. 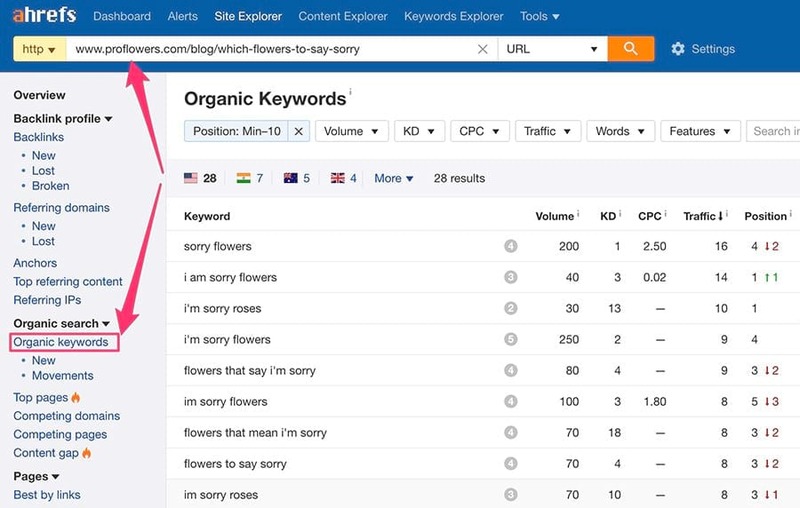 The top5 ranking pages for the keyword “I’m sorry flowers” also rank for over 50 other relevant keywords, which brings each of them around a hundred highly targeted visitors per month. We have a very large database of keywords at Ahrefs, but it is impossible to include all the existing search queries there. That is why Ahrefs always underestimates the amount of keywords that a page is ranking for and the amount of traffic it brings. Which means the actual search traffic to a given page will always be bigger than what we estimate. 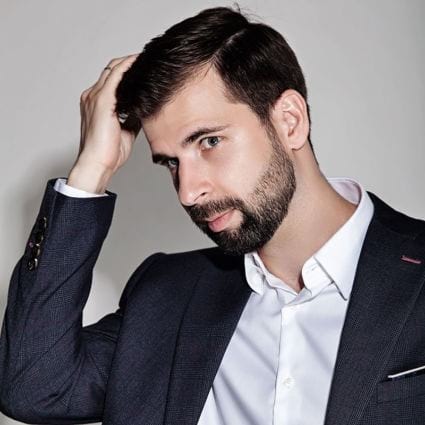 And if you adopt this new strategy, you’ll be getting around a hundred highly targeted visitors per month from ranking anywhere in the top5 for this keyword. But apart from finding the topic with high traffic potential, what else can you do to maximize the amount of keywords that your page will rank for? 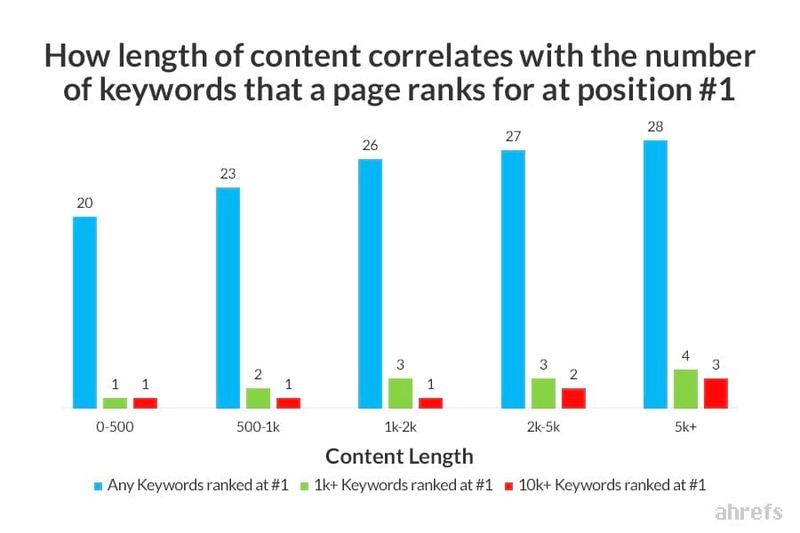 Looks like longer form content tends to rank for more keywords, which is not surprising in any way. And still longer form content performed better. There were quite a few studies (ours included) that showed a rather high correlation between the backlink factors of a page and its Google rankings. 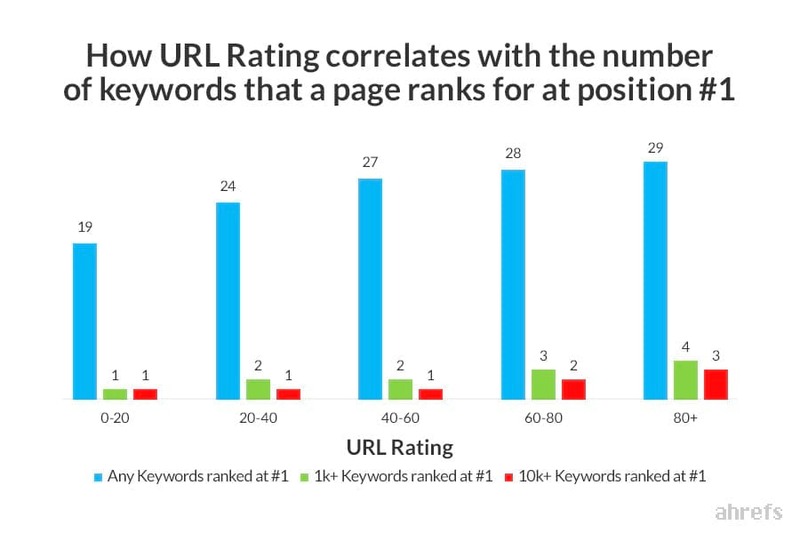 But I don’t think I’ve seen a study of how backlink factors correlate with the number of keywords that a page ranks for. The above graph shows a pretty strong correlation between URL Rating of a page and the number of keywords that it ranks for in the top10. And still, pages with a stronger backlink profile performed better. This is just a quick reminder that correlation does not imply causation. So the above research doesn’t allow us to say that backlinks help you rank for more keywords. All we can say is that pages with more backlinks tend to rank for a larger number of keywords. How unique are the “also rank for” keywords? 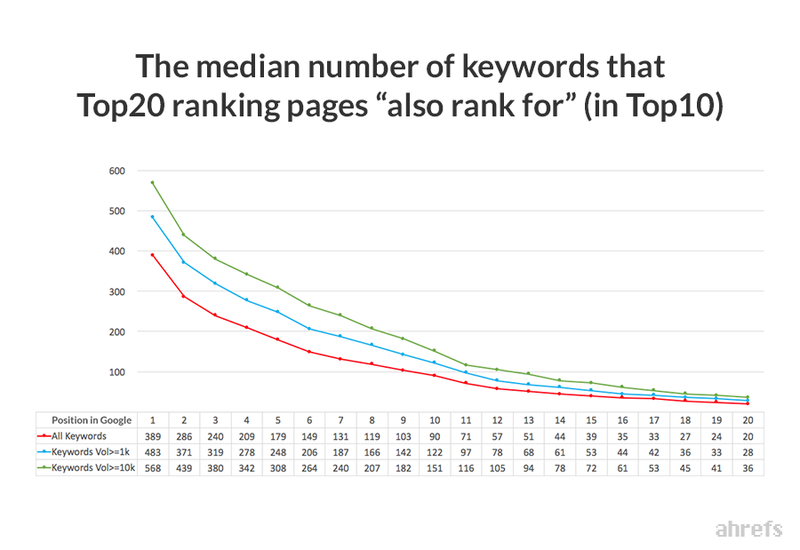 Our goal was to see how many keywords that a page ranks for are unique to the point where they don’t have even a single common keyword with the rest of the group. 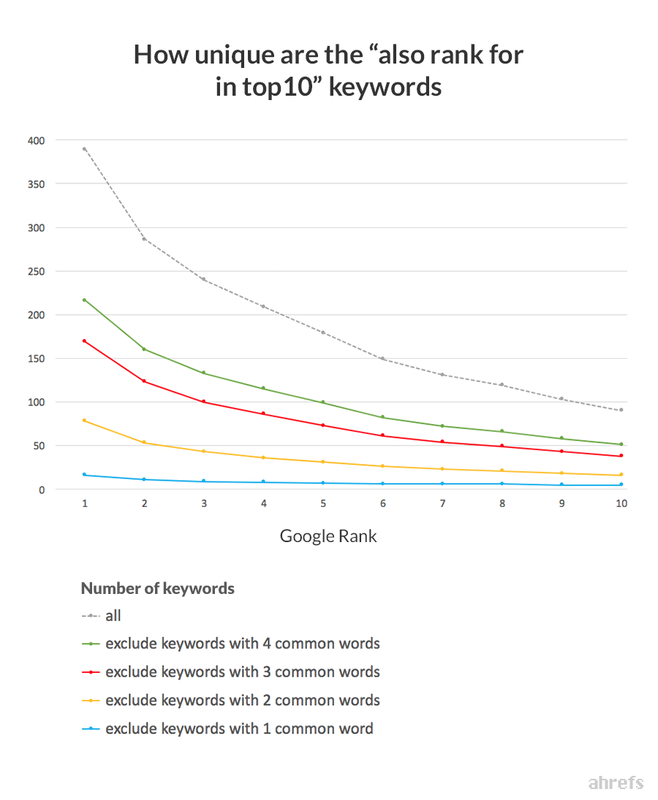 As you can tell from that graph above, the number of “unique” keywords (that don’t have even a single common word with others) is extremely low. Which even further supports the fact that ranking for a huge number of keywords is all about picking a popular topic, which people would search for with the same words but different search queries — as opposed to targeting multiple different topics with one page. So that was our (rather brief) research of the “also rank for” keywords and I hope you’ve learned something from it. 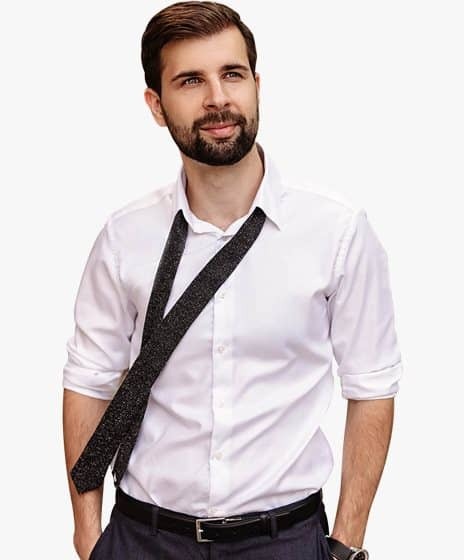 Let me know in the comments which takeaway you enjoyed the most and if any of our experiments have raised further questions that you would like us to answer with some follow‐up research.